WEST LAFAYETTE, Ind. — Late blight of tomato, a serious plant disease caused by a fungus-like organism, has been found in Indiana for the second straight year, according to Purdue University plant pathologists. Purdue’s Plant & Pest Diagnostic Laboratory (P&PDL) late Wednesday (June 30) confirmed that a plant sample from a home garden in Dearborn County near the Kentucky border was infected with late blight. The Dearborn County sample is the only known case of late blight in Indiana at this time. Egel urged all tomato growers to inspect their plants for signs of disease and direct questions about late blight to their Purdue Extension county office. Fungicides may slow the progress of late blight, Egel said. Retail products that contain the active ingredient chlorothalonil may reduce the spread of the disease if applied on a regular basis. Trade names include Bonide™, Daconil™, Exotherm Termil™ and PathGuard™. Organic growers should use copper products, Egel said. Late blight attacks a tomato plant’s leaves and stems. Infected plants develop brown lesions with whitish borders and sometimes discolored fruit. Late blight spores travel on storm systems and can be blown up to 40 miles from an infected plant. The disease damaged tomato plants in at least 30 Indiana counties one year ago – the first outbreak of late blight since 1998. It is believed late blight entered Indiana in 2009 on tomato seedlings sold at retail businesses and later replanted in home gardens. 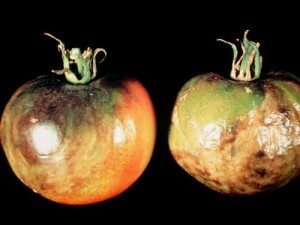 The disease then spread into commercial tomato fields. Already this season late blight has been confirmed in northeast Kentucky and eastern Ohio tomatoes and southern Michigan potatoes.